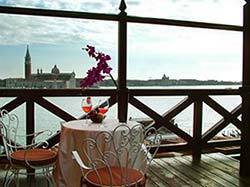 The Hotel Paganelli has a remarkable setting for a three-star hotel: It faces the Riva degli Schiavoni, the waterfront promenade above the Piazza San Marco and the Doge's Palace, which is home to many of the city's first-class and luxury hotels. As you leave the Alilaguna Linea Blu waterbus station, bear right. The Hotel Paganelli will be a few meters ahead of you, to the right of the Hotel Savoia & Jolanda. Get off the boat at San Zaccaria. As you leave the boat station, angle left toward the row of buildings facing the waterfront promenade. The Hotel Paganelli will be just beyond the Hotel Londra Palace and the Vittorio Emmanele II monument.